Report dog fouling using our online form. Alternatively, you can contact us on 01242 775178 to report incidents of fouling and one of our community protection officers will ask for your help in identifying the dog owner. In cases where there is sufficient evidence, owners could be issued with a fixed penalty notice. 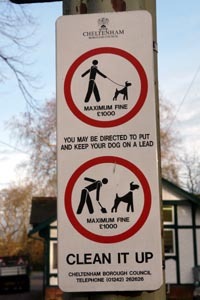 Failing to pay the penalty may lead to prosecution with a maximum fine of £1000. It is extremely important that people clean up after their pets and especially dogs when being taken for walks. Small bags can be purchased from supermarkets for this purpose.